Now more than ever SeaWorld is under scrutiny for bad behavior. They have been found negligent in the death of Dawn Brancheau, and continue to be exposed as exploiters and abusers of dolphins and small whales. Most recently, “Death at Sea World“, a book by David Kirby, “Blackfish” the recently released documentary by Gabriela Cowperthwaite, and the academy award winning film, The Cove reveal how terribly dolphins suffer at the hands of SeaWorld, making huge profits for the Blackstone Corporation. The Macy’s Day Thanksgiving Parade has become a family tradition that is meant to represent all the good things in life and that includes honesty, kindness, loyalty, all components of a good character the one thing SeaWorld seems to lack as is evidenced by their treatment of people, orcas, and all the dolphins and small whales they use to put on shows for their entertainment parks worldwide. In addition, SeaWorld’s total lack of regard for human safety continues putting the lives of trainers at risk of death or injury from working closely with the many “Shamus” of the SeaWorld collection. Wild and Free in the Puget Sound! 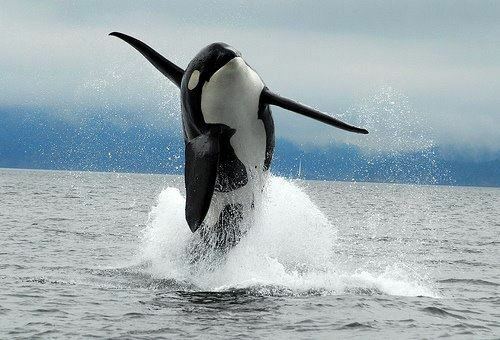 Join the Tweetstorm and Support Orca Freedom! This entry was posted in Cetaceans and tagged Blackfish, Death at SeaWorld, Dolphin, Macy's Day Thanksgiving Parade, Orca, SeaWorld, the Cove, Tillikum by Kirsten Massebeau. Bookmark the permalink.